For 50 plus years our family has made this probably not very authentic, but absolutely delicious Parmesan Toast. Mom called it Garlic Bread, but as years passed and I grew up, I came to realize hardly anyone else made Garlic Bread like this. 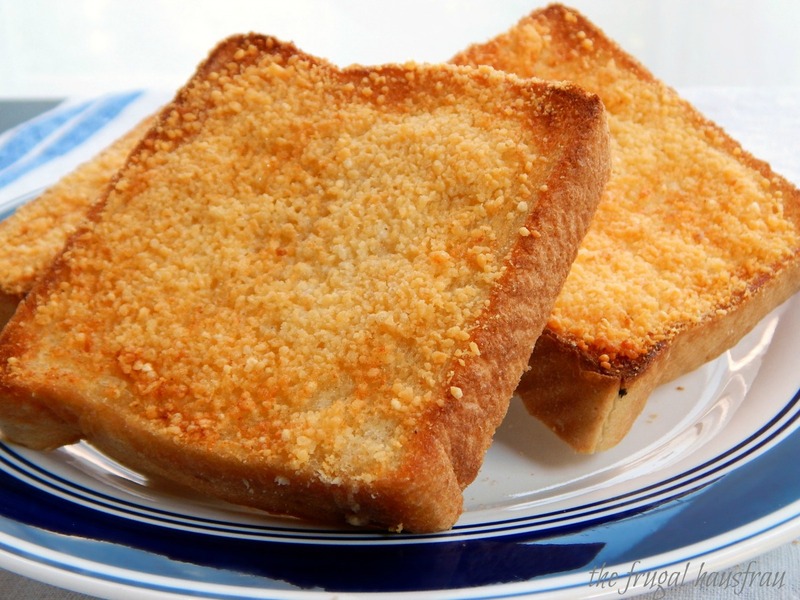 So, a new and unique name evolved: Parmesan Toast Garlic Bread. We make it out of almost anything we have on hand from Italian bread to any odds and ends. Hamburger buns, hot dog buns; just about anything is fair game. This is not really a recipe, just more of a method, and is a great way to use bread that is leftover or slightly stale. I try to make extra because I think it’s great for breakfast the next day. I suppose I’d have to say, this is comfort food to our family. Mix softened butter with garlic powder or garlic salt to taste. Spread on bread – whatever you have on hand. A loaf of French or Italian bread, cut on the diagonal will need about 3/4 stick of butter, so that will help you judge how much to make for smaller or larger amounts. Sprinkle with cheese – here is one case where we actually like the canned cheese – it’s nutty and gets a gorgeous brown color, but if all you have is really good Parmigiano-Reggiano, that would work in a pinch:). Place directly on top oven rack (or you could use a cookie sheet, but a rack is better; some bread on a cookie sheet will collect moisture on the bottom) and broil for several minutes. Leave the oven door open an inch or two, and watch like a hawk – it takes seconds to go from golden brown deliciousness to slightly burned. How long it takes really varies with the type of bread you use and how far it is from the broiler. Usually three or four minutes does it. Ready for the broiler. I like to put them in a line and right under the element. We like to serve it with Italian food, or even with soups for lunch. Personally, if there is any left over, I’ll have a piece for breakfast! This entry was posted in Click here for Fabulous Food Posts and tagged Bread, Cheese, Easy Recipe, Family Recipe, Frugal Hausfrau, Garlic Bread, leftover bread, Parmesan Toast. Bookmark the permalink.